We have a new product at ClearClick that we are excited to let you know about. It's called the Video2Digital Converter. With this easy device, you can transfer your videos to digital format with the touch of a button. Convert your VHS collection and enjoy your old movies again. Restore and share your family memories from 20 years ago. You can watch your new digital videos on your computer, tablet, smartphone, or your TV. Or burn your videos to DVD or even upload them to YouTube. Watch our "How It Works" video here. Bonus: with the included Prism Plus Video Converter software (published by NCH Software), you can convert your digital videos into smartphone and tablet friendly formats. You can also compress your videos, so that you can share them online and through email. 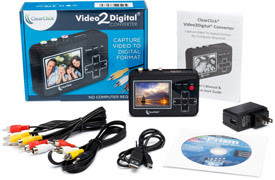 As always, the Video2Digital Converter comes with ClearClick's free USA-based tech support and full 1-year warranty.